The Imperial State Crown is part of the Crown Jewels. Click on the zoom tools or choose a different view. Use the zoom tools or for more jewels click on "previous" or "next object". You can also see other uniforms, robes and dresses worn at the Coronation. Their blue robes are similar to the Garter Robe worn by Edward III in the 1300s. This clip introduces three kings named George - George I, George II and George III, and their queens. This masque was written for Charles I in 1634. Use the zoom tools, or for a closer view of Henry VIII click on an arrow button. Click on a time period. 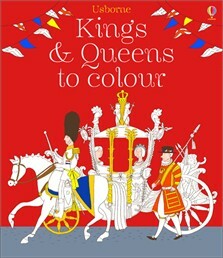 Colour in sumptuous scenes of royal life and discover fascinating facts about the history of the British monarchy. Detailed pictures show King John signing the Magna Carta in 1215, Elizabeth I's famous speech at Tilbury, portraits of the Scottish Kings and Queens, Queen Victoria’s coronation procession and crows and royal regalia. Some of each picture is already coloured, so children can focus on the interesting bits. Each page includes information about the British monarchy through history.